This is another rare West Coast screamer that nobody listens to – they’re all dancing to the other salsa tinged side “Sugar”. And that’s OK as far as these things go but it doesn’t even get anywhere near the passion and fire generated on He Needs Her. This fantastic group ballad has everything you always wanted – some tight harmonies and a high lead taking them all the way home. Check out his falsetto shrieks and howls – sensational! The backing is effective enough if a little unadventurous but the vocals are simply wonderful. I wonder which church they came from - and no doubt went back to. 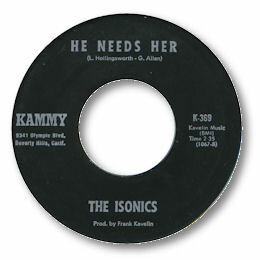 UPDATE ~ My great friend Greg Burgess, who can find out more about obscure records and artists than anyone else I know, has written about the Isonics to say that "the L Hollingsworth who wrote both sides is probably Louis Hollingsworth who wrote most of the cuts on the pretty dire ((well it's really a rock record) LP by 'The Gangsters of Love' on Capitol ST11237in 1973. Members are Louis Hollingsworth / Dennis Dillon / Laurence Harrison, jr. / Ralph Torres / Roland Padilla / John Brown / Steve Sanchez / David Day)." Greg adds that "a few listens to both cuts suggest to me that he is featured in the Isonics and the Gangsters of Love. He is definitely not the falsetto though but the baritone in the background." Greg has also noticed that Louis Hollingsworth was the writer of Pee Wee Shuck & Huey's rare Flagg 45 "I know we're in love". Greg wonders "Is it the Isonics in the background?" Can anybody confirm?